Identification: This aeolid has a sky blue head and body with a yellow medial line beginning on the head and extending onto the body. 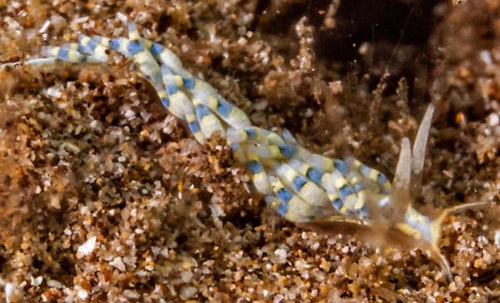 The cerata have a bright blue band sandwiched between two yellow rings. In some individuals, there is an additional black ring between the blue and yellow bands as well as black lines on the head. Natural history: Tenellia sp. #1 is a rare species that has been found in moderately exposed to exposed rocky locations from < 1 to 6 m (< 3 to 20 ft). Taxonomic notes: It was first recorded in Hawaii from Barge Harbor, Lanai by PF on Sept. 22, 1990 and was formerly placed in the genus Cuthona. Photo: PF: 4 mm: found by CP: Mala Wharf, Maui; Oct. 4, 1990.